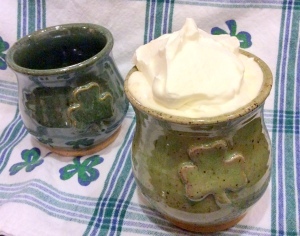 Try one of these Irish coffee recipes in a beautiful hand-made stoneware Celtic Spirit mug. Combine ingredients in an Artists At Heart St. Patrick’s Day Spirit mug. Note: Whipping the cream is an extra step, but really worth the effort. If you’re not up to in, prepared whipped cream in a can will do nicely. Place sugar on a plate or shallow bowl. Lightly wet the rim of your Celtic Spirit mug with a moistened paper towel. Dip the rim in sugar to coat. Pour Irish whiskey into the prepared glass. Fill with coffee to within 1/2 inch of top. If you have a recipe you’d like to share, please post in the comments or send us an email.